As I mentioned in my last post, I wanted to give you guys a bit of a “peek-behind-the-curtain,” to show you our sweet Warhawk server setup. The Warhawk IGS method means that instead of us forcing players to be connected to the SONY “mothership” for any and all games, we instead let players host their own servers on their own PS3s. This is fairly unique and it enables a couple of really nice benefits. First, since Warhawk is a global online game, our IGS method scatters game servers quite literally into player’s homes all over the planet — the US, China, Europe, Australia, and Japan! No matter where you live, what time you want to play, or what language you speak, you’ll always be able to get your game on. Secondly, this helps with latency. If you haven’t heard, Warhawk is a fast game, a very fast game, so we wanted to ensure you had the best chance of finding servers with good ping times. We also wanted to make sure people could host *and* play on their own servers. After all, why should you have to connect to a server a gazillion hops away when you know that there are Warhawk servers running in your state or city? Possibly on your same ISP? Maybe even friends in your neighborhood or buddies in your dorm? Hence our desire to develop an IGS system for Warhawk. All that said, we still want to make sure that there are always an abundance of wicked-fast Ranked Dedicated servers available for players. The images that accompany this post were taken by our very talented IT team here at SCEA. 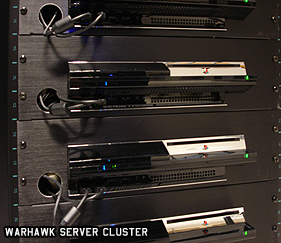 And yes, what you’re looking at is an enormous server cluster for Warhawk…of rack-mounted PS3s! During the public beta, many of you wanted *way more* Ranked-Dedicated servers to play on so you could level-up and earn awards, rank upgrades, etc…. In addition to players being able to host their own servers, 32-player “dedicated” servers for your clan practices or 24-player “player” servers, SONY has made a great commitment to all of our Warhawk players by staging Warhawk Server clusters similar to this one all over the world. The system that our IT team engineered for Warhawk is truly killer and we couldn’t be happier with the setup — and hopefully players will be stoked too once the game launches. Just for the record…I am fairly confident that our IT team is not comprised of Autobots. For those of you who participated in the beta, you may remember toward the end that some players started to “spoof” the official SONY server names — shame on you. I will find you all online and shank you repeatedly or snipe you in the crotch! So…in the beta forums you all asked for a way to identify official SONY servers from player servers…Again, your wish is granted. When Warhawk launches, all official servers are displayed with an eye-pleasing blue color in the server list. This gives players a really quick way of picking which server they want to connect to. Alright, this post is getting pretty damn long so I gotta wrap it up. The last thing I want to mention, and those of you who participated in the beta already know this, is that we don’t force game match-making on to our players with Warhawk. When you log-in to Warhawk, you get a server list…a *global* server list (with customizable filters of course), just like many of us have come to love from years of PC gaming. *You*, the player, get to choose the server you want to play on. If you don’t see a server out there that has exactly what you want…then launch your own. And yes, you can play on your own server too…even in 4-way split screen. Well…hope this gives you a bit more info on Warhawk’s server system and setup. If you have any questions please post them in the comments and I’ll try to answer as many as I can. The power behind PLAYSTATION Network is simply awesome! Sounds great! Can’t wait to play this game! Thanks for answering our questions, but will we be able to share this game with 5 other activated PS3’s like the other games available through the PS Store? sounds awesome! Looks like it is going to be a great game. What’s the head count over there?? THAT is an awesome display of PS3 prowess. I seriously can’t wait to get back into Warhawk. I was one of those poor guys that was trying to log in to the game even after you’d locked us all out. Some pretty funny links there too… wrap it up is hilarious. correct me if I am wrong, but being able to host your own servers also means that the servers can’t get shut down right? thats another benefit I think. I was so pissed when they stopped the the MGS3 servers, or all of those games from EA. I was part of the BETA, and my heart was crushed when the BETA ended. Thank goog the game is almost out so I can put my Warhawk skills up and running again. This game rocks and cant wait to get it. 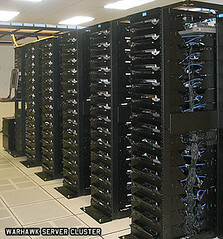 PS: Just wondering if those server rooms are hot as hell with all that PS3 power running? hows the ventilation in those rack-mounts? doesn’t look like much room to ventilate out of the back. What a sight!!! All of those glorious PS3’s lined up like that is seriously impressive. Kudos to Incognito for being serious about the PS3 online. This is awesome, I can’t wait to get my hands on this game. Hopefully no delays! Hmm… I work for an ISP. We use to host some of the fastest CS(couter strike) servers in the world. what’s up bloggers? When you see Chacal ya’ll better run. It would appear that they have just solved the only two complaints that I could come up with during the Beta. Exxxxxcellent! I have a question. Does Warhawk use the XMB’s friends list or it’s own friends list? Oh my [DELETED] God! That looks amazing! PS3 looks awesome! I can’t wait to download this game. How much is Warhawk going to be off the UK PS Store? I’m pretty confident Warhawk uses the XMB friend’s list, with voice chat, dedicated servers all for free (excluding the price of the game). WOW. Stacks of ps3s there. That’s pretty awesome. Sounds very cool, I just hope my internet connection is good enough. Does a 32-player server filled up require a very strong connection, or is a mediocre connection good enough? …all this info. and we STILL don’t know if the game will give players access to their PSN Friends List. Well, will it SONY? Please tell us! wow cool use of ps3’s. this hosting setup for warhawk is great. Im glad is doing some innovative and is being open with regards to multiplayer and networking. Sony deserves this console race on principal alone. Keep up the good work. im not trolling, but is that what sony is doing with their unsold ps3’s? Great job on keeping us informed. I have to say if it was not for this blog by SCEA I would not be getting Warhawk on day one. And yes the stacks of PS3 looks very nice. That is alot of Cell BE’s in one place. I hope that room has AC. I really enjoyed the beta and can’t wait for the game to be released. It looks so odd seeing all the PS3 to be stacked like that and them being used for a server. But very cool! Wasn’t the Warhawk FAQ supposed to be up YESTERDAY? How will clan support be implemented? Will clan leaders need to “invite” people in their clan like in Resistance? Will there be a Friends list different from the XMB friends list? Or will the game use the XMB friends list? Will the game support more than one BT headset per console (for online split-screen multiplayer)? DAM I wish I had that many PS3’s…………. Wow. This is a must have game! Great job! Any word on EU release date and price? I would also like to know this. One thing I hate most about online matches is when somebody with a horrible connection tries to play a match with the maximum number of players…..then everybody lags and the match gets dropped. Is there a feature that recommends a match limit depending on the connection? I know that UbiSoft did a patch for GRAW that did this, so I was hoping there was a similar feature to combat the issue I stated above. I seriously cant wait to get my hands on Warhawk. Playing with friends against the world is gonna be pretty cool. Tell Gerg I’m coming for him… he can camp the TOW all he wants. Thanks for the very detailed information. It’s nice to read on how a game or design is put together and it all comes together. How about larger pics, I’d love to make the bottom left picture my background for the PS3. We are trying to collect all your questions so we can make a more comprehensive FAQ post. Just wanted to let you all know that we’ll be trying hit your questions “in-bulk” rather than giga-tons of little comments. I know you can pull up your PS3 friend’s list(the XMB one), and see who’s in Warhawk, in what match, but are there going to be invites? For example if Jim is in the XMB will I be able to send him a message inviting him to play in my match, similar to Mortal Kombat 2. I was part of the warhawk beta and i wanted to know how much cleaned up the game is now in terms of performance, and if you have improved anything else. Also, how large is the warhawk file going to be if i choose to download it instead of buying it off retail? Will Warhawk be able to support more than one headset for split screen online play? It would be great if two or more people can talk online through the same PS3. @ SCEA how about talk, its pressing a button? please, say me yes!!! nice to see all those dedicated PS3 servers :) most of the time with the peer servers there would be problems during the beta, but the dedicated one ran so much better. ive always wanted to see an online server. Hi Dylan what happened with the warhawk Q and A? I was REALLY looking forward to it!